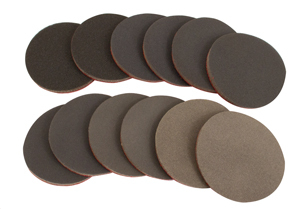 These Hook and Loop discs are perfect for polishing a wide range of materials and finishes. Exotic or other woods, plastics, stabilized wood, metals and more. A soft non-woven silicon carbide with soft cloth and foam backing make these discs very flexible to conform to any surface. The grits range from 180 to 4,000 allowing you to achieve a flawless surface on pens, boxes, bowls and many other projects.